On the evening of the 3rd of October 2018, it has been reported by several news outlets that the FBI has completed the very limited extended background check into the history of Judge Brett Kavanaugh early years. The report is supposed to be secret. As I’ve previously surmised, we cannot expect the republican FBI Director Chris Wray and the US Department of Justice Deputy Attorney General Rod Rosenstein to buck White House direction of the investigation. One reason is that different rules apply to background checks than to independent investigations. The FBI is obligated to act at the direction of the White House and there has been ample leaking that the FBI agents were severely hampered in who they could interview by Judge Kavanaugh’s good friend and the White House Counsel Don McGahn. He has already resigned as White House Counsel pending the completion of this one mission, that of catapulting his close friend to a seat on the US supreme Court. While the FBI agents were given reign to make contact with 6- 9 people which was an improvement over the original four, they didn’t interview at least 40 witnesses who had wanted to provide data to the FBI and who were in a position to provide crucial data. To Director Wray and the Deputy Attorney General Rosenstein, Judge Brett Kavanaugh is not merely the target of an FBI investigation. He is a longtime colleague, political ally and perhaps even friend. The three men have known each other for decades, working closely on the shared mission of advancing conservative judicial and policy goals. We simply cannot expect these two FBI/ DOJ officials to block the advancement of their fellow conservative and longtime colleague Judge Kavanaugh to the highest court in the land. Even Dr. Christine Blasey Ford who testified at the 9/27/18 US Senate Judiciary hearing about how she had been allegedly sexually assaulted by Judge Kavanaugh and his friend Mark Judge during their high school years, was never interviewed even though she had wanted to do so. 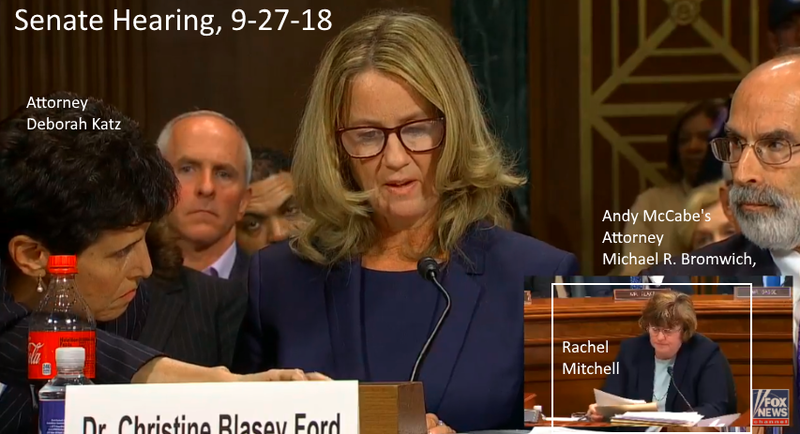 It is only logical that she had important details to share that she did not feel comfortable to say at the very public hearing. In addition, the FBI agents were expressly directed not to delve into Judge Kavanaugh’s drinking history. 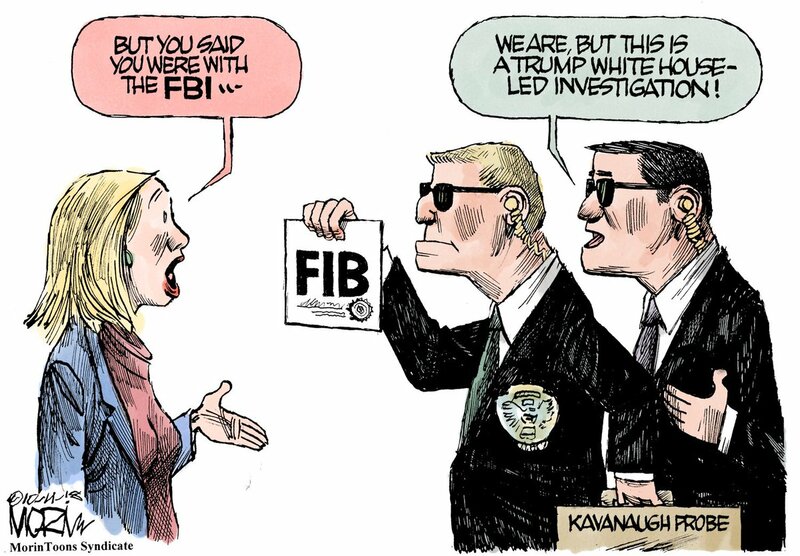 In short, the FBI probe was done at the most minimal levels to give cover to republican lawmakers that an investigation was done even though the FBI agents were barred from doing an adequate background check and everyone involved is well aware of this to where the republican President Donald Trump felt free to personally mock and attack the credibility of Dr. Christine Blasey Ford at a recent campaign rally, which was met by laughter and chanting from the crowd. The US Senate Majority Leader Mitch McConnell feels so confident with this FBI report that he has announced the scheduling of the final senate vote for around the 5th- 6th of October 2018. This historic vote is being scheduled in the midst of widespread protests by those against the confirmation of Judge Kavanaugh, which the Senate Leader McConnell did take to the floor to publicly decry as reprehensible behaviors by the opposition. Frankly, Senator McConnell needs to get outside of his bubble. His lawmakers can’t continue to hide, not conduct town hall meetings, not answer their phones and then foolishly think that they don’t have to face their constituents. IT’S ALL BEEN A SHAM … there was really no intent to do what it was supposed to be! There is no low for this president. He is not only the worst president ever but he is the worst person ever. I have no doubt regarding Dr. Ford’s credibility. I had fellow bloggers Gary J. and Crustyolemotman,warn me that the fix was in and that the FBI agents had been severely ham strung, but I pushed back because I foolishly wanted to hold onto some faith in my government. Is there nothing we can count on anymore? All I can say is, that I better not hear about folks not voting at this upcoming November 2018 election. And so, just as we suspected, the investigation was a sham, and he will likely be confirmed by the senate on Friday, despite the fact that over half the nation objects. I wonder if at least two of Flake/Murkowski/Collins will vote ‘Nay’? Once again, We The People, the employers of everyone involved in this mess, have no voice. Thanks for the update, Gronda. Barring some form of divine intervention, all GOP members despite some having reservations, will vote in favor of the confirmation of Judge Kavanaugh or else, they will be subject to a political backlash which they are not willing to withstand. We do have a voice, it’s at the ballot box. Don’t let my writing demeanor, fool you. 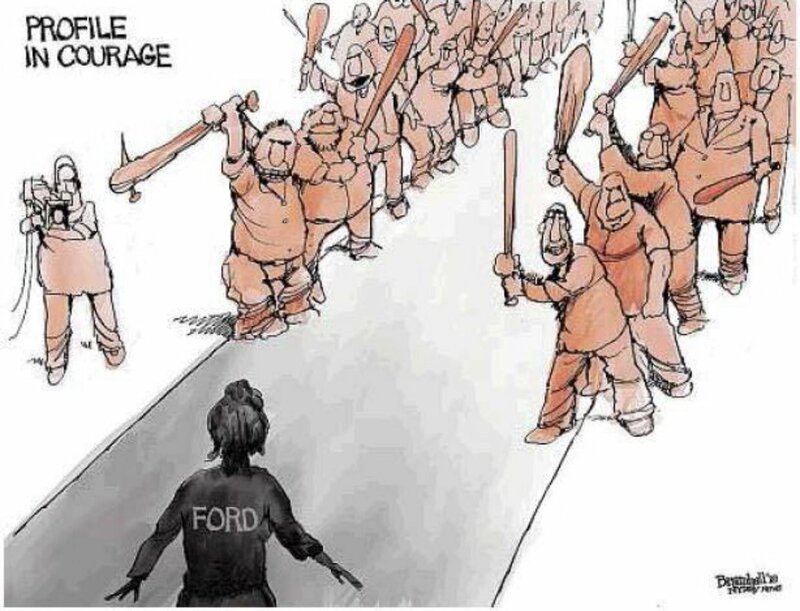 I’m past furious over the treatment of Dr. Ford by President Trump. I want to see Judge Kavanaugh properly investigated; the data reviewed that the GOP lawmakers in the US Senate Judiciary Committee had access to prior to the 9/27/18 hearing. If they are guilty of what I think they are, I want Judge Kavanaugh impeached and the Majority Leader Mitch McConnell outed. I can’t decide which GOP leader is most guilty of dividing this country. It’s a toss up between President Trump and Senator Mitch McConnell. Yes, I am beyond furious as well, and McConnell is determined to push this through before they have a chance to really think about it, or before something else turns up that could disqualify him. Yes, we have our vote, and hopefully will make a significant change next month, but it will be too late to stop this fiasco. I’m with you … McConnell & Trump are both Grade A Jerks!!! Sigh. The USA did not have a President during this era. Only a fellow who occupied the Whitehouse due to the flaw in the voting system. That darn vagrant squatting in the White House has managed to do a lot of damage. Senator Mitch McConnell likes to win. He may win this battle but he’ll end up losing the war. His legacy in the US history books will not be a pretty picture. Winning at all costs has its price. Oh indeed Gronda, historians will be lining up to vilify this creature and there will not be a thing he or his acolytes can do about it.